Victoria, BC artist Deborah Leigh is completely self-taught, with the exception of one course (to learn how to apply paint). 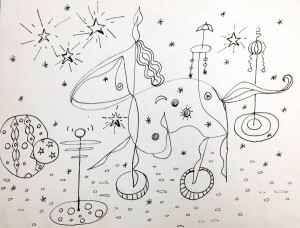 She didn’t begin drawing until age 55, with no previous creative outlets. 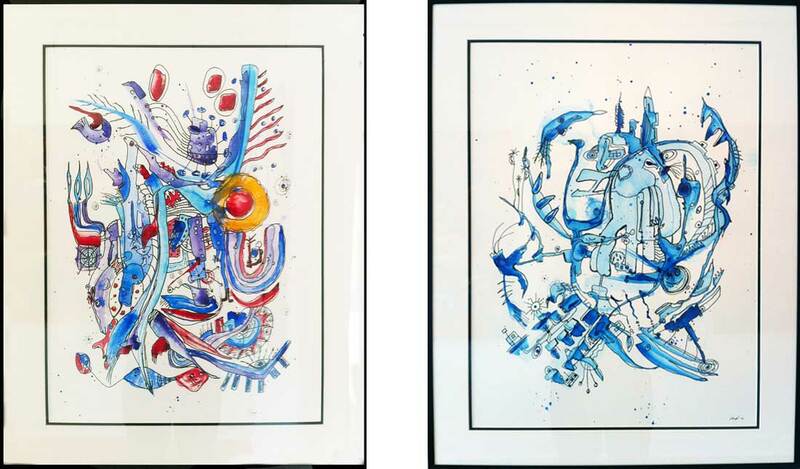 She began by drawing playful, detailed images and within just a few years she was exhibiting and selling her work. Now represented by the Victoria Emerging Art Gallery, Deborah’s work is currently on display in the gallery’s new space above the Shatterbox Coffee Bar in downtown Victoria. 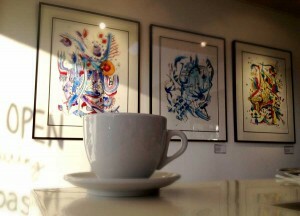 We met there for coffee and a chat, surrounded by her intricate and energetic art. I think it’s so interesting that you didn’t start drawing until your 50s. Yes, I was 55. I brought a couple of my first drawings [shown below], to show you where I came from and where I am now. My work has changed quite a bit. It has, but you already had a definite style even then… very freeform and imaginative. If someone was to say ‘draw a bird,’ I wouldn’t be able to do it. It has to come on its own terms. I just go for it and make it up as I go along. Actually, to tell the truth I started from a hospital bed. I have dealt with and struggled with major depression and extremely low self-esteem, and I just started to play around a little with pen and paper. It’s been a great healer. It’s helped make me more relaxed, stronger; it kind of woke me up to the world. Once you started, how soon did drawing turn to painting? Pretty well around the same time. I experimented with acrylic paint, and tried different styles, but I never really could get into painting the way I did drawing. What I do is not really painting though; it’s just slapping down colour. I work two ways: either I put the paint down first and then fill in the spaces with black ink, or I do the drawing and then colour it in. I’ve just come to this revelation I guess that I’ve found my niche, and I’m comfortable and very happy doing what I’m doing now. It’s exciting. And I’m getting really good recognition. I just love doing it, and I have to do it every day. It brings me peace. We live in a pretty crazy world and this makes me feel sane. You just never know what‘s inside, what might come out. A creative outlet can be very healing. Yes, I highly recommend it. It’s powerful, and has got me through a lot. My only regret is that I wish I’d started this 30 years ago, but you can’t have those years back, so just make the best of right now. It’s often said that things happen when they’re meant to. I was thinking about this… the art that I’m doing today, maybe 30 years ago wouldn’t have been the same. Maybe all my experiences in life that were buried away in my subconscious and built up over the years… now I’m releasing them in my drawings and paintings. I wasn’t looking for it and had no idea I was going to be doing this, it just fell into place. And it’s getting better all the time. When you sit down to create and you have a blank paper or canvas, what inspires you? Well, it’s just kind of a feeling. I just take my paper and the pen, put it in the centre, and just go for it, and I make it up as I go along. Sometimes I’ll just pause and wait for it to come, and something says go over here…. go up here…. I don’t want to sound all “woo woo” but it’s like I’m being guided. I’m not sure, but that’s what it feels like. And when that’s happening, it’s the most awesome feeling. It’s just magical. And there’s always a surprise at the end, it’s like opening up a present – you don’t know what you’re going to get, what’s going to be the outcome of that drawing. It feels so good to see what I’ve done. I don’t know if it’s bad or good, it doesn’t matter. If it feels good to me, it’s good enough. I’ll only put out stuff that I feel is good. Whether other people like it is up to them. I like the idea that people can look at my work and interpret for themselves what they might see. A lot of people have looked at my art and pointed out things to me that I never noticed before, and that’s exciting too. Yes, I’m starting to believe it now. Over the last six years it just seems that almost everything I’ve attempted – different shows, approaching a gallery – I’ve always been accepted. So I guess I’m starting to believe it now that yes, I guess I do ok! What would you say to people who think it’s too late to get started? Oh, go for it! Absolutely. You just never know what‘s inside, what might come out. Just take that first step and go for it. Deborah Leigh’s work will be on display at Shatterbox Coffee in downtown Victoria until March 16. Visit Deborah’s web site to see more of her work. great story…should inspire many to just do it! I facilitated a workshop this weekend to make prayer flags for an exchange with a cuban community. i had a group of men and women who attended, all but two were non-artists but wanting to participate. It was a blast. they came for an afternoon of adult creative play time, and some of the results were surprising and beautiful. So you never know what is buried in us all until you have an opportunity to unleash it. Congrats Deborah, beautiful and interesting work…..from another late bloomer and another Deborah. That must have been SO cool to see those people creating things for the first time! Often people say “I’m not an artist” or “I can’t draw” and I bet they’d surprise themselves if they just give it a go and have fun with it. Thanks, Deborah! Yay, I love introducing people to new artists! Glad you enjoyed it, thanks for visiting Pauline! I’m so glad I discovered your website from SITS. I love reading about these artists. I’m going to be in BC soon to watch a friend graduate and am going to stop by the Museum of Anthropology at UBC. I might check out the Gallery where today’s artist is displayed. Thank you for reading, Sheila, and for returning to the blog, I appreciate it! I hope you get a chance to see Deborah’s art… have a great trip! Thanks, Kate! Very inspiring! I love that Deborah found her calling later in life and she encourages people to “take that first step and go for it!” Words to live by. I was very inspired by Deborah too, and really glad that I get to share her story with more people! Your site is awesome. I am still amazed at all the subject blogs I’m discovering since joining this blog world at the end of last year. This is grand motivation for it never being too late to start something new. I’m 31 and I hear so many of my peers complaining about what they should have done & I’m wondering…what are they thinking, there’s always time. Great post. Thanks Joi! I love discovering new blogs out there too, there are so many good ones. Glad you enjoyed it, thanks for visiting! Very insipring! I like the message that it is never too late to follow a dream and try something new. Aww, what a sweet comment! And you’re right, Kelsey… she is! I cried reading this. Deborah is my Mom as well and I am so proud of all she has overcome and that her dreams are coming true. She deserves all the happiness and success available to herThank you for featuring her on your blog. oxo. It was an absolute pleasure to meet and interview your mom. These comments from you and Kelsey made my day! What an amazing and inspiring story. Her art is wonderful, and so is her story. This inspires me to start drawing again. I haven’t drawn in years (I’m 56), but lately I’ve been wanting to find that part of myself again.